I am here to let you know that you have all of the support, knowledge, and skills that you require to achieve the goals you have set for yourself. Moreover, you must trust your instincts and act on your dreams. In addition, allow the Universe to support your actions by letting go of your personal and material concerns. In other words, believe that you are headed in the right direction and unconditionally trust this path. Let go of any self-doubt and enjoy your journey as you embrace your purpose and resolve your fears. Learning to trust in something that is intangible is not the easiest of tasks. Use faith to get yourself past any initial fears and self-doubts. Your dreams have revealed your path. It may not be straightforward, but any step is a step in the right direction. Set small goals that will eventually achieve your destination. There are no obstacles other than those you have placed in your way. I am also reminding you that by using your passion and drive to reach your goals you will develop the ability to love and accept yourself unconditionally. Doing this will enable you to remain focused in the present moment and centered in your self-confidence. Be passionate about everything you say, do and encounter in your day to day life. I also want you to be aware that your friends recognize you for your reliable support and compassion to others. When you reserve any judgment of others with forgiveness and love, you allow the world to find a balance around you. Not all of us can walk a perfect life. The world must somehow find an equilibrium in its emotions and physical responses. Understanding that every hero requires a villain is a vital concept to integrate into your daily life. Know that your confidence in reaching your goals, trustworthiness as someone to confide in, and your sage advice on all matters will make you a prized friend and confidant for others. Share your wisdom and your passion. Share your insights and intuitions and above all: Love What You Do! Archangel Gabriel brings you valuable insights and guidance for the future. Closely associated with Christmas, he plays a significant role in Christianity, Judaism, Islam and many other religions and faiths. Because of this, she often acts as a messenger of God. Therefore, he is often portrayed with a trumpet. Archangel Gabriel specializes in sending clarity, communication, and loves to orchestrate new ventures that are related to your “soul’s purpose“. Change is inevitable with his presence. 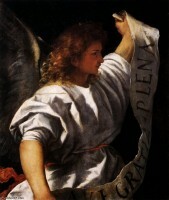 If you wish to develop your skills of prophecy and foresight, call on this Archangel for help. Problem-solving becomes also becomes effortless with sudden insights and solutions readily available. Pay close attention to your dreams if you have asked for help. When Gabriel is close at hand, a white or copper light will encompass you. This archangel emanates white light that delivers purification wherever it is needed. I suffer from depression and anxiety, so my husband and I moved to a house in the mountains for peace and meditation. I have been here for about 6 months, and within those 6 months, I’ve seen a white with sometimes a blue edge of a flashing light. I’ve seen it 8 times in the same area at night and in the morning at 4:58 am. It bounces and moves around, changes shape from a square to a flash of long light. I’ve always believed in my Guardian Angels and Guides, and I feel that someone is looking out for me/us. I read here about the light, so, I thought I’d share. Thank you. I was sitting here and heard some kind of noise and saw something moving out of corner of my eye. I looked over and this bird is walking back and forth on window ledge. I noticed in the one picture that my vase that is crystal clear and you can see all the way through has stripes in it with many different colors. I just thought that is kinda weird and decided to share my morning. I was wondering if this has meaning for me and what that meaning is? Oh yes, that bird has a message for you! Look it up as a spirit animal to see what it has to share. Today’s message was exactly what I needed to hear simply because it affirms what I had already received within and had written about in my journal today. All this angel stuff makes me feel a little woo-woo, but every so often I feel inwardly prompted to visit this site, and always I see a message that makes me feel that I am not alone and that The Universe is, indeed, aware of me and my current struggles. Thank you. greetings.. thanks for wise words that gives me hope, and show me how my life is… thanks can I ask question if there’s any danger tomorrow or if theres something I should do which is important?